We’re using Spring MVC, configured mostly by annotations, a custom scope for FactoryBeans so they don’t get created once per request, and autowiring by type. This makes for simple code, where the configuration lives right along where it is configured, however after a certain number of autowired beans, performance was abysmal. Click on to read the full post. My 8 core box was taking >3000ms to load the /home/ page and after these changes went to <300 ms. (This was in a configuration isolate from any backend service calls or databases – it used stub data, so should be very fast). Before it couldn’t handle over 2 concurrent requests, after we were doing 2 concurrent requests with 70 ms max response times. (Under 300ms for 8-16 concurrent requests). How did I do this? I discovered it via profiling the app. I was surprised at so much activity in getting the classloader. Drilling down further, I could see where Spring was calling over and over two slow methods in getBeanNamesForType: isFactoryBean and isTypeMatch. 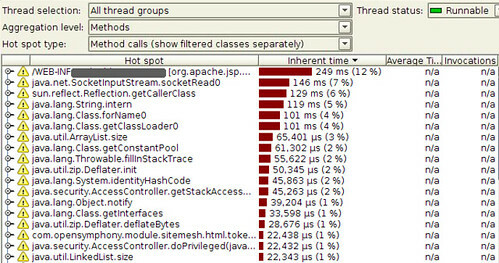 Here’s the same load under profiling, after adding the caching. I didn’t find much else about this for Spring’s slowness in Autowire by type. Please let me know if you find this helpful. Thanks. Subscribe to comments with RSS or TrackBack to 'Spring Slow Autowiring by Type getBeanNamesForType fix 10x Speed Boost >3600ms to <100ms'. Nice metrics you show here; however I don’t understand why your app has to autowire stuff when loading the home page… Shouldn’t your dependencies be set, once and for all, right after the application context is initialized? 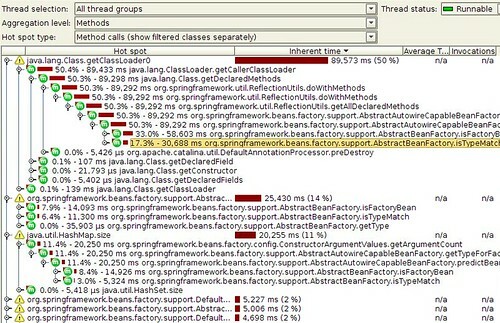 We had request scoped beans, so they were instantiated every request. Is it necessary to always return new CachingByTypeBeanFactory() in CachingWebApplicationContext ? Would it not be enough to create one instance and serve it all the time? Well done – I’ll give it a try. Jonathan is a Lead Consultant at ThoughtWorks where he delivers test driven working code into production, serves as a tech lead, and works closely with clients.